That the executive will on the 1st day of January aforesaid, by proclamation, designate the States and parts of States, if any, in which the people thereof, respectively, shall then be in rebellion against the United States; and the fact that any State or the people thereof shall on that day be in good faith represented in the Congress of the United States by members chosen thereto at elections wherein a majority of the qualified voters of such States shall have participated shall, in the absence of strong countervailing testimony, be deemed conclusive evidence that such State and the people thereof are not then in rebellion against the United States. On Jan. 1, 1863, U.S. President Abraham Lincoln declared free all slaves residing in territory in rebellion against the federal government. This Emancipation Proclamation actually freed few people. It did not apply to slaves in border states fighting on the Union side; nor did it affect slaves in southern areas already under Union control. Naturally, the states in rebellion did not act on Lincoln's order. 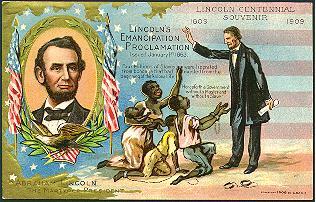 But the proclamation did show Americans--and the world--that the civil war was now being fought to end slavery. Neither slavery nor involuntary servitude, except as a punishment for crime whereof the party shall have been duly convicted, shall exist within the United States, or any place subject to their jurisdictions.